I’ve found something new to experience. It came in a surprising package unexpectedly after a friend’s birthday dinner. I was completely caught off guard by its powerful simplicity over my life. I was just happy to have some chocolate, but then to look down at the wrapper and read inside “Take time for yourself today. Love, Dove” really touched my spirit and curiosity. Not to mention the setting of me sitting on my bed when I unwrapped it to add to the experience. When I read that while biting into the small piece of milk chocolate I believed what it said and felt empowered by it, strangely enough. It was an odd feeling; I guess because chocolate never consciously made me feel this way. For that moment I felt like I was relaxing and truly taking time for myself- like a mini vacation or peaceful nap. My mind drifted into a quick meditation of those words until I completely swallowed (#nopause) the chocolate. Lately, living at home has been stressful because although I am the youngest in my family much is required of me. I’m use to just doing me, but now I have to stay on my toes with whatever needs to be done for others in the house (i.e. my mother’s request) on top of my own personal business. To add insult to injury my family doesn’t believe I’m doing anything because I’m on the computer all day instead of being at a ‘job’ (which all I would be doing is sitting at a computer in my office/cubicle anyway). It’s all an adjustment for me and definitely trying. Life isn’t all bad, but not what I’m used to since I was away at college for four years doing whatever I pleased. So you can imagine how taken aback I was when this piece of chocolate took me to another place and so quickly. – You have a great laugh! Call me crazy, but yes I kept the wrappers. I absolutely love them! !I’m inspired. I feel like somebody cares. 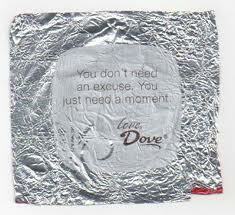 This Dove chocolate has become my new way to relax. I am a simple Hershey chocolate kinda chick (kisses, cookies and creme, and milk chocolate with almonds, etc) but I think I will start buying Dove now; the chocolate is pretty good and the wrappers are like the whip cream and cherry on top. Every time I pop open a chocolate I am pleasantly surprised by its message as you can probably see. Its like the next best thing to a vacation and I can really use a vacation right now, Miami please! Interestingly, Leo Stephanos, the creator “named the chocolate Dove for its “peaceful” quality.” That’s exactly how it makes me feel! The chocolate was created in Chicago on the south side and in 1991 they began printing the delightful messages on the wrapper. Just in case you’re like me and curious about its history. I love this Blog about Dove Chocolate, I’m coming to realize we have a lot of things in common, Book Stores, Dove chocolates…lol! I recently discovered Dove a few weeks ago myself and let’s just say after reading this I’m looking for my car keys to make a stop at CVS to pick up some. This is definitely a great product. Thanks for sharing. I know, right! 🙂 That is so crazy. Great post. I’m not much of a chocolate lover but I could see how the wrapper could brighten someone’s day. Dove needs to pay you for this post lol.